I absolutely love roses. These Julia Child roses blooming in my garden are beautiful and smell delicious. I love walking outside when they are in full bloom because the entire yard is perfumed by their delightful scent. Roses are not hard to care for, but they do have some specific growing requirements. One of the most beneficial things you can do to promote flowering for your roses is knowing when and how to prune them. My first attempt at gardening was not fruitful. Nearly everything that I planted died within a few weeks. The only plants that survived were some beautiful multi-colored impatiens planted in a shady spot under an oak tree in our front yard. These lovely lollipop flowers lasted about two weeks, until the deer discovered the tasty treat. If you’re new to gardening and don’t know where to start, here are some key things I’ve discovered that will accelerate your learning and your enjoyment in your garden. I purchased these newly-revived daisies on clearance for 75 cents each because they were near death. A little TLC and they are performing beautifully. What zone do I live in? Geographies are categorized by zones, if you live in the U.S. The difference between one zone and another is determined by both the warmest and the coldest temperatures that particular region typically experiences in a given year, referred to as “plant hardiness”. Knowing what zone you live in will help you to determine which plants will do best in-ground, in containers, or maybe not at all in your region. You can find your zone by visiting the USDA Plant Zone Map. What is my soil type? This one piece of information completely changed my gardening experience and has given me so much more confidence in gardening. In our area, the soil is clay-like and has poor drainage. Drainage refers to how quickly water is absorbed into the soil. Most plants need good drainage in order to survive, otherwise the roots become saturated with water and rot. A quick test you can conduct is to spray an area with a hose until it begins to saturate. If the water disappears quickly, you have good soil drainage. If you see water “pooling”, your soil drainage is poor. You can get really technical with soil types to determine if it’s alkaline or acidic. You can purchase a kit or take a soil sample in to a local plant nursery for them to test it. I’ve never done this. However, I did ask a local nursery how to change (you’ll hear this referred to as “amending”) the soil. In my case, the soil needs acid to break up the clay. I purchased some acidified compost, which completely changed the soil in a flower bed that was drowning in pooling water. 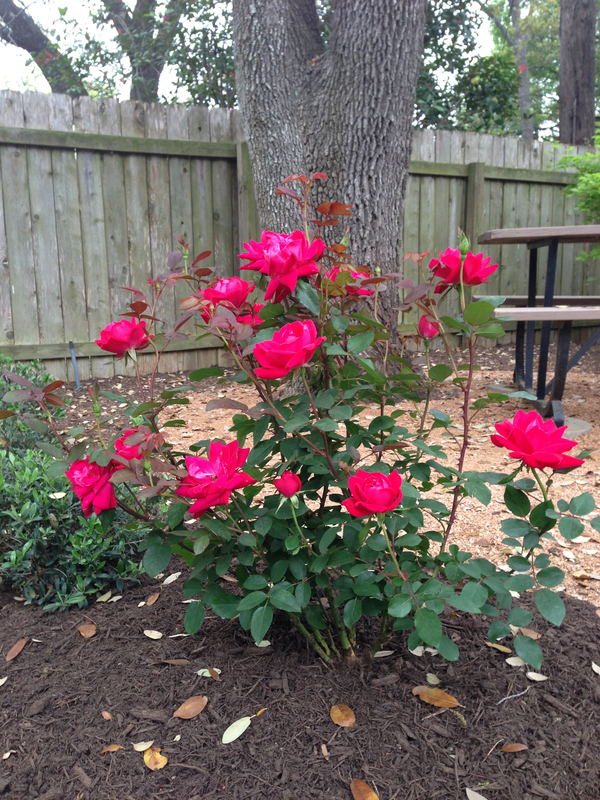 I removed all of the bushes, amended the soil, and now enjoy some fabulous roses in that bed. 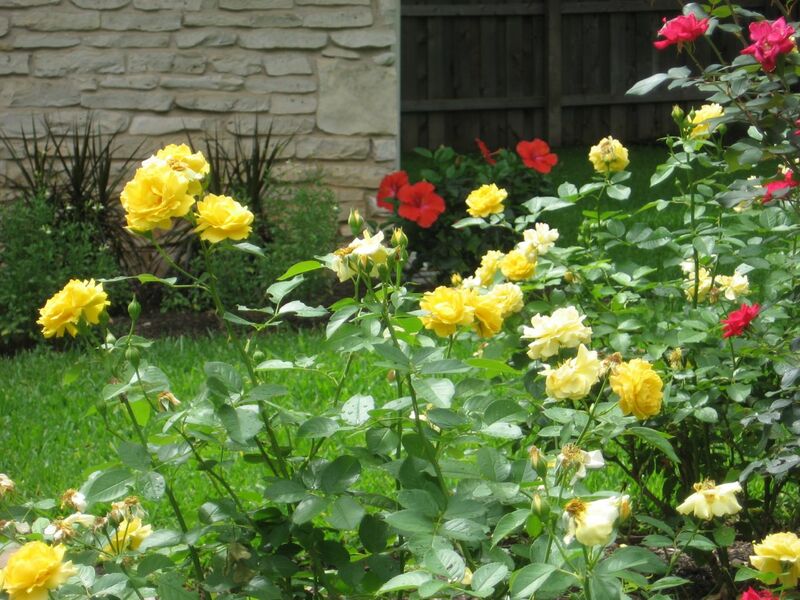 I will need to continue to add compost to it every few years, as the roses will absorb the nutrients in the soil. If left untouched, the soil will eventually resort back to clay. Based on what part of town you live in, you should be able to discover what your soil type most likely is by visiting your local nursery.